The Liesbeeck River has supported human settlement for hundreds of years as it flows from its source on Table Mountain to the shores of Table Bay. It sustained nomadic herders of cattle and sheep in the earliest days and later immigrants built their homesteads along or near its banks, living there with their slaves and their descendants. 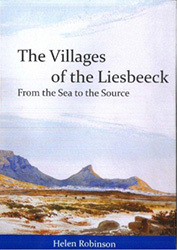 The villages of the Liesbeeck were established on these simple foundations and Dr Helen Robinson traces their development into the multi-cultural residential and commercial centres that they are today. It is a story of change from a simple agrarian economy to a vital modern lifestyle, which was fueled by the technological advances of the 19th century and came to fruition in the next 100 years. Above all, it is the story of a struggle for recognition by men, women and children against a background of hope and despair, of affluence and poverty, of ignorance and understanding. It is a significant segment of Cape history and an acknowledgement of all the people who made it.